This isn’t really about still photography, though the points do somewhat crossover. It’s also not really about feature filmmaking where you’re going to build sets and have them for weeks or months at a time. We have our own studios to use at SFilms, but we’ve also rented studios in many cities across the country. (For a peek at the studios we have available, click here.) What’s important to know when renting a studio for a corporate video shoot? So let’s get to it. 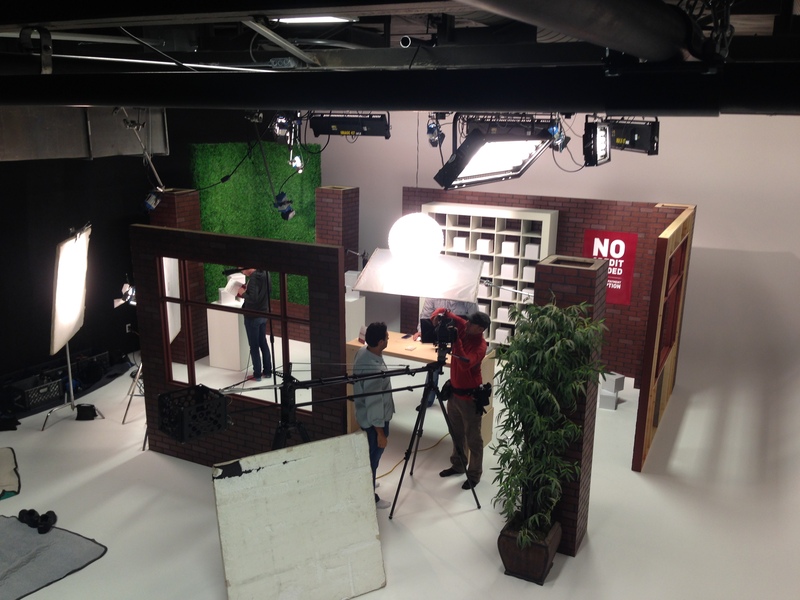 When looking at video studios, take a look at the quality of the stages. Did they adequately sound proof the studio? Do you have enough power? Are the ceilings high enough for sets and lights? We have shot in studios before that might have had a nice new coat of paint and clean, but you could hear the traffic noise outside the doors. Then we booked our client to come in and do a six hour presentation. We can’t stop and wait for trains to pass. 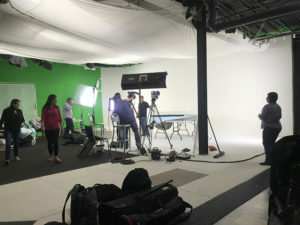 Do the studios offer other facility needs? Like dressing rooms, makeup rooms, green rooms. Take a look at the parking. Can you not only get there and park, but if you’ve got trucks or gear coming, do you have an easy way to access the studio you’re going to be setting up in? Sometimes it does come down to money. Studios will usually rent you the space by the day (and occasionally by the hour if you work with them a lot). You also might need a half day the day before to setup and light. And that brings up other services– studios have a rate for “dry”– just the room. Or you might get a rate for supplying power. Then lights. And grip equipment. Make sure when shopping for a studio, you know what the rate they give you entails. Studios come in many different configurations. Small might be the size of a large office (15 feet by 15 feet). Others might be mammoth sizes where you could play a football game inside the space. Make sure you find a studio that fits the job you need it for. You don’t want to rent that large studio for one person talking head against a green screen. It’s better to use the smaller one for that. (Besides the obvious cost difference, sound is typically better in the smaller stages). Then do you need a seamless cyclorama (cyc)? White or green (or blue)? Black? A one wall cyc? Or a two wall cyc? Standing sets you can use? Studios will usually have a cyc of some sort, but make sure it’s painted for what you need. Have them do that before you arrive. Be aware that when you have a white, green or blue cyc, make sure it’s clean, especially the floor. Studios have to often repaint all the shoe and scuff marks that occur in a production. Does the facility have qualified people? Many times, you might be bringing in a local crew, but studios usually come with a couple of people to grip and gaff for you. Do they know their stuff? You don’t want to ask for a power tie in and have the in-house guy stare blankly at you. When you are shopping for a studio to rent, these are good things to keep in mind, to help get that apples to apples comparison.